I live in an area classified as zone 6. I planted Calla Lilies in my garden about 3 years ago and they have been coming back every year which goes against everything I have read about the plant. Should I be treating my other plants as if I live in a different zone or is this simply due to more mild winters over the past few years? How much of a gambler are you? 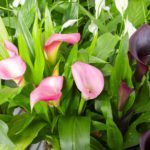 Success in keeping calla coming back in your zone will depend on how wet your soil is, how severe the winter is and whether you have snow insulating the soil from repeated freeze and thaw cycles. There is wide variability in winter hardiness so a general answer to your question is not possible.